Daystar's Polyurethane Control Arm Bushings can upgrade the stability of your turns by keeping wheel alignment stable and body roll in check much better than the original rubber bushings. 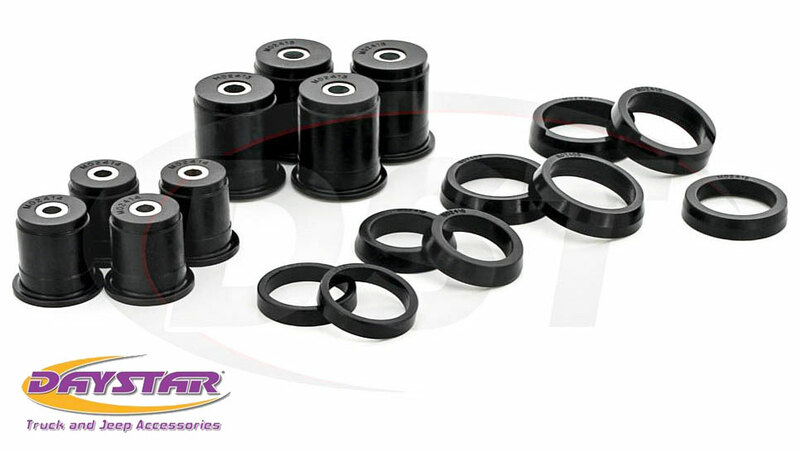 Check out Daystar control arm bushing kits for your vehicle below. Whether you're taking a modified Jeep out on the trails every weekend, or hauling 1 ton payloads in your truck during the week, wheel alignment is a big deal. For one thing you want those expensive off-road tires to wear evenly to avoid premature replacements, but when your control arm bushings are bad the camber angle (tilt) of your tire can be thrown off and cause excessive wear on the edge. Loose bushings can also cause handling issues as the weight distribution can be thrown off by a shifting body during a turn. When you're hauling a 40ft goose-neck trailer of square bales in your truck you don't want to worry about steering wander, but if your front control arms are loosely connected to the frame because of worn bushings you could notice a drift. 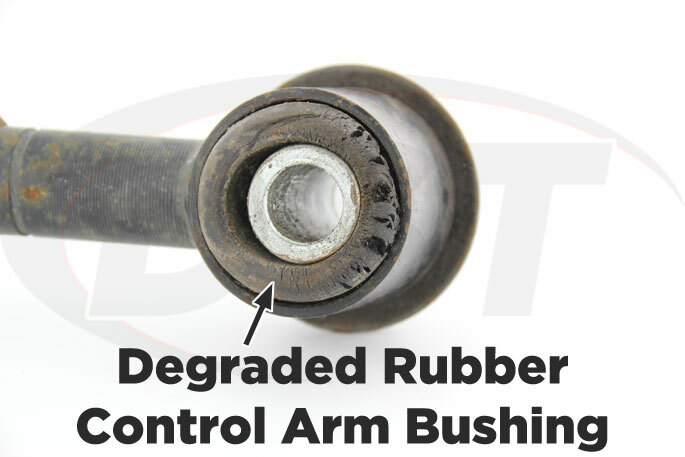 If you want a tighter connection between the frame and control arms that will last then Daystar's control arm bushings are your answer. The special formula that Daystar uses in their polyurethane control arm bushings is much stronger than the OE (original equipment) rubber that comes installed on your vehicle. When your suspension travels the bushings are keeping the metal components from grinding together, but this takes it's toll on rubber and can cause it to stretch or bend out of shape. Polyurethane holds it's shape through extreme circumstances and Daystar puts their control arm bushings through rigorous testing to make sure you're getting a part that can handle whatever you throw at it. A firmer Daystar bushing can, and probably will, allow more vibration and noise to make it's way to the cabin, but your wheels will hold their alignment through hard turns, rough trails, and heavy loads much better than the original rubber bushings. If you're looking to get more life out of your tires and sharpen your handling in a turn then upgrade to Daystar's polyurethane control arm bushings for the front and rear.